"AnyCard now handles the grunt work while I just supervise. It saves time, energy, and eases frustration!" "Installation is easy. The software will dial the center and with a click of the interface transmit the customer's credit-card info." What Does It Do? AnyCard Professional is a software program which is used to authorize credit cards. It's an innovative approach which uses your Internet connection. Processing time is one to two seconds and it's all automated. More information. AnyCard is now being offered free . . .
Free. AnyCard Professional was originally priced at $149, but we are now offering it free. There are no charges for program. No hidden costs. No fees. No gimmicks There is no adware built into the program. We don't even ask for your email address (which many companies use to build up their mailing lists). Merchant's Account. In order to authorize cards, you'll need to shop around and set-up an account with a card processor. That's done elsewhere. We don't handle that. 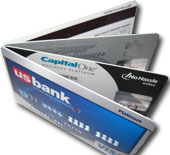 We just provide the software which allows you to authorize cards. More information on setting up a Merchant's Account is found below. Why Free? There are lots of hands in the credit card pot - all entities trying to make sure they get their share. The word "generous" is not even a part of credit card parlance, but we think that businesses, particularly credit card businesses, need to regularly examine themselves and spend time being generous: helping their employees, their customers, the environment, and the world in general. We believe in that strongly. AnyCard is one small way that we can be generous, a way giving back to the community. It's our gift to you. We don't need the income. Sales of our other software and products are doing just fine. And, yes, we agree that it's only of minor importance in the larger scheme of things, but we hope that, at the very least, it can be a small example - and one that makes your life a little easier. AnyCard is a first class program all the way!" Support? We are happy to offer the program free, but since there's no income, we can not provide support. Nor can we answer questions about it. We are small company and simply don't have the resources. So . . . if you try the program, try it with the understanding that phone or email support is not available. Help Documentation. Although we don't offer support, we do provide you with excellent help documentation - which, by the way, is filled with dozens of illustrations. The help documentation is built into the program. Plus we provide a PDF manual which covers the same help information found in the program but in manual form. All in all, you'll find that the program is very easy to use. The only difficult part is getting your Gateway configured. If you run into problems doing that, we suggest you contact computer savvy friend or IT personnel. "AnyCard is so much fun I wish I had more daily opportunities to use it!" With AnyCard, you can use one of two methods of processing cards: Gateway (which uses the Internet), and Touch Tone Processing (which uses a phone line). The Gateway method is the quickest. (More about Touch Tone processing, below). What are Gateways? Gateways are employed by websites and shopping carts for credit card transactions. But AnyCard has the special ability to process cards through a Gateway without going through a website. AnyCard by-passes the website intermediary and sends the card data directly over the Internet. It meets all encryption standards, and it's very, very fast. Approval times typically take less than one to two seconds. In order to use this type of credit card processing system, you must have an account with a credit card Gateway. If you have a website and a shopping cart that takes credit cards, you may already have the necessary account. AnyCard is able to handle most of the common Gateways, but some are easier to implement than others. Authorize.net is one that works well, but there are many others. For a list of Gateways, see Supported Gateways. However, if you'd like to try out the software, it's not necessary to have a merchant's account. AnyCard comes with two Gateways which allow you to process test cards without signing up. This is a great way of getting started and learning how the process works. When you obtain a Gateway account (or if you already have one), the evaluation version of the software allows to authorize "real" credit cards. AnyCard saves time, energy, and eases frustration!" AnyCard Professional primarily uses Gateway processing but it also includes Touch Tone processing. That provides you with two ways of processing cards. The following is more information on how Touch Tone processing works. Touch Tone is not automated like Gateway processing. It's a manual system, but it is simple and you don't need an Internet connection - just a phone line. Briefly, when you use Touch Tone processing, you start by calling the processing center. Once reached, the processing center's computer will ask you to key-in your merchant number, the customer's card number, the expiration date and amount. It isn't easy keying in all those numbers--and that's where AnyCard can help. With AnyCard you get everything set up in advance. When you're ready, you click a button, and AnyCard dials the processing center for you. When the processing center comes on the line and asks for the merchant number, you click on the merchant number button, and AnyCard keys in the number for you. When the processing center asks for the credit card number, you do the same thing, and AnyCard keys it in for you. And so on. Then when everything is keyed in, the processing center's computer will come back with the authorization number which you write down or type into a dialog box provided by AnyCard. Basically what AnyCard does is to take the place of a person trying to punch all the buttons on the phone. You simply get everything set up in advance, and when prompted by the processing center, you click with your mouse to enter the numbers. If, at any time during the call to the processing center, you need to talk to a representative, you can. If you want to key in some of the numbers yourself, you can. You have total control. AnyCard is there to help when you need the help. "This is a well designed product which processed our credit card transactions with speed and accuracy." -- Al Stehlik Expositions West, Inc.
AnyCard's distribution files are placed in a self extracting zip file. Self extracting zip files make software installation quite easy. After you download the file (above) to a directory on your own computer, double click on the file name (AnyCard40.exe). A small dialog box will appear with the message: "Ready to Install AnyBook." To start the installation program, click on "Unzip" button. The files will be unzipped and the main installation program will start, and it's just a matter of following the directions on the screen. For your security, AnyCard program files are carefully checked with anti-virus software. Additionally, they are re-tested and thoroughly scanned for viruses. There is no adware in the program. We do not ask for or collect any information. We don't even ask for a name or an email address. "Thank you for designing AnyCard software. We operate a Bed & Breakfast in Missouri and AnyCard is perfect for us!" A complete help system accompanies AnyCard. You'll find a "Getting Started" section under the Help Menu. We also provide the help documentation in the form of a PDF Manual. AnyCard is free. At one time, we charged $149 for the program, but we are now offering the program at no charge. The program that you download is fully operational. It has no limitations. Since the program is free, it is not necessary to register the program. We do not ask for, nor collect any information on the users of the program. We don't even ask for a name or an email address. The following review is by Andy Rathbone. Andy is the best selling author of the Windows for Dummies series and other computer books. He has penned more than 25 books and sold over 10 million copies worldwide. More than any single author, he has helped make the world of computers and computer software friendlier and more understandable for us all. Here's his review . . .
Larry Bass uses AnyCard for his furniture company, Bass Furniture, located in Pensacola, Florida. We added a rounding feature to the program at no charge so he and his sales staff could pre-approve purchases. He wrote recently and said "You and your program, AnyCard, are first class all the way!" He also sent along this endorsement. . .
"For small businesses that frown at buying/leasing expensive credit card machines, try the AnyCard! program which makes obtaining telephone approval codes a snap. This easy-to-use program has often spared me and other coworkers the frustration of trying to perfectly punch in strings of credit card numbers, expiration dates, merchant numbers, and 11 digit phone numbers on a phone pad all the while knowing that my slightest pause or falter would trigger vengeance from the credit card gods." --Larry Bass, Bass Furniture Co.
John Kellas uses AnyCard for his business, Mt Parameters, an international electronic and computer equipment sourcing company located in Canada. Since he switched to AnyCard for credit card processing, he no longer needed his card terminal. He returned it to the bank and saved his business the $12 monthly fee. "Your program is so much fun I wish I had more daily opportunities to use it!" Al Stehik is a Trade Show producer in Beaverton, Oregon and uses AnyCard in his business. "This is a well designed product which processed our credit card transactions with speed and accuracy. This product was easy to learn and well worth the small investment. This product replaced a $200.00 product which was available only through the bank." 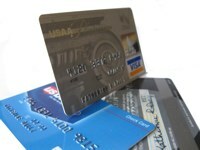 In order to use AnyCard (or any other type of card processing software), you'll need set up a merchant's account. We don't handle that. You'll need to do some shopping around and find the best for your business. Gateway Processing. Gateway processing uses your Internet connection. Processing time is one to two seconds and it's all automated. This is the one that most business will select. In order to use the Gateway processing feature built into AnyCard, you'll need to set-up a merchant's account with one of the 60 included Gateways (see Supported Gateways). You can select the one that works the best. We like Authorize.net because it doesn't require expensive and intrusive "security" software that a number of the others require, but, of course, you aren't limited to that company. Touch Tone Processing is provided by some card companies, but is often not found in their promotional materials. You'll need to ask to find out if they provide the service. Having said that, however, the best way of incorporating credit card processing in your own program is to use the professional tools available at n/ Software: Credit Card Processing Tools for Developers.